The centrepiece of Angela's role at the National Gallery of Victoria (NGV) is curating both special temporary exhibitions and displays of the permanent collection. This involves travel to view possible inclusions, preparing publications for each exhibition, contributing to public programs and liaising with the media, managing logistics and "lots of looking at spreadsheets!" There are many joys for Angela in her role, not least being the opportunity to work with a wonderful collection. Angela is drawn to the practical and aesthetic aspects of working directly with art - supervising hangs, seeing people respond to the works, reaching a broader audience. She loves the collaborative and interactive nature of her role which suits her enjoyment of communication and public speaking. Angela's Doctor of Philosophy (Arts) candidature provided many relevant skills for curatorial work. In addition to research and archival skills, she particularly values the development of "an analytical mode of thinking, the skills of paying attention and asking the right questions so critical for success in curatorship." She also cites the value of literature reviews which developed her capacity to "pull together everything to find a new angle, to build an argument and offer possibilities." Angela emphasizes the transferability of all these skills, enabling her to work with varied collections, from different places and periods. Angela was very open to the idea of an academic career and has worked as an academic at both The University of Melbourne and La Trobe University. But throughout her candidature Angela had some significant experiences which prepared her for other possibilities. As a research assistant she wrote for NGV catalogues, and early on her love of writing led to arts journalism work. She prepared educational lift-outs on NGV exhibitions for non-academic audiences, and also contributed to several other arts publications. Angela’s postdoc with the Australian Research Council (ARC) Centre of Excellence for the History of Emotions was a curatorial/research position based on a partnership with the NGV. 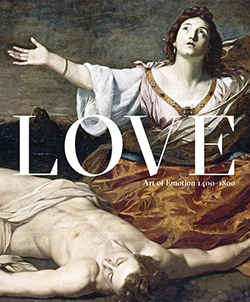 She curated the highly regarded exhibition for the NGV Love: Art of Emotion. Angela has also worked in a curatorial role with The Johnston Collection.